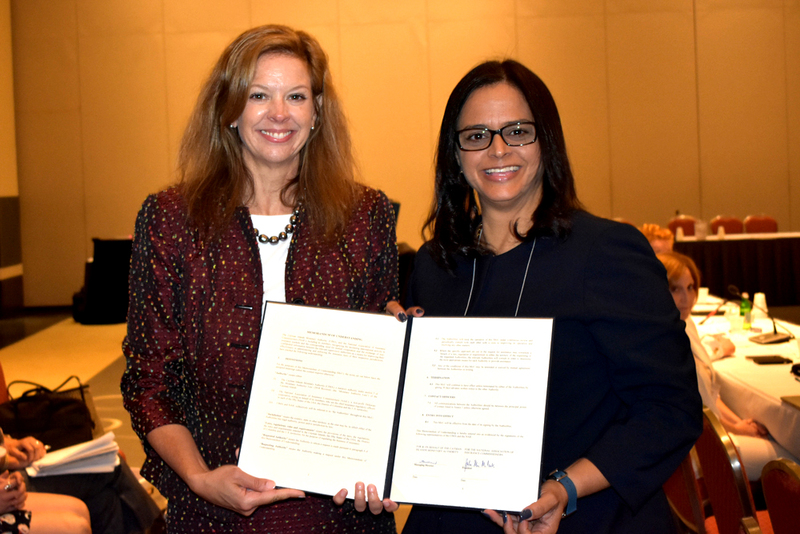 President and Tennessee Commissioner of Commerce and Insurance, Ms. Julie Mix McPeak, and Managing Director of CIMA, Mrs. Cindy Scotland (right) complete the signing of CIMA’s newest MOU between the NAIC. Grand Cayman (Monday, 13 August 2018) The Cayman Islands Monetary Authority (“CIMA” or “the Authority”) signed a memorandum of understanding (MOU) with The National Association of Insurance Commissioners (NAIC) on 4 August 2018. The signing took place during a meeting of the International Insurance Relations (G) Committee at the 2018 NAIC Summer National meeting held in Boston. The MOU is designed to help insurance supervisors in the United States and Cayman Islands coordinate on regulatory issues with the goal of efficient, fair, safe and stable insurance markets. The agreement also encourages a formal framework to provide mutual assistance and exchange of information to assist in better understanding and coordinating compliance with applicable laws, regulations, rules and requirements in each jurisdiction. Over the years, the Authority has established good working relationships with various state regulators within the U.S and other regulatory, standard setting bodies outside of the Cayman Islands. To date, CIMA has entered into 55 bilateral agreements and 6 multilateral agreements with regulatory authorities, including the International Association of Insurance Supervisors and U.S. Banking regulators (Federal Reserve System Board of Governors, Office of the Comptroller of the Currency, Federal Deposit Insurance Corporation, and Office of Thrift Supervision). CIMA’s Managing Director, Mrs. Cindy Scotland expressed that the signing of the agreement is another significant milestone in the Authority’s ongoing collaboration with the regulators of the world’s largest insurance market. “I am confident that this agreement will strengthen the relationship between the NAIC and the Authority. It will also provide stronger capabilities for each organisation to achieve our common goals of economic stability and consumer protection,” said Mrs. Scotland.